This rich Mohave Beige Granite vanity top will add the finishing touch to your bathroom. The natural beauty of stone coupled with its durable, lasting appeal will bring luxurious style to any vanity. The durable top has a penetrating sealer that protects against stains by blocking pores and small cracks in the stone. A pre-attached white Vitreous China undermount sink, matching 4 backsplash and sidesplash are included, along with drillings for an 8 center faucet. The top is finished off with a meticulously cut Ogee edge detail around the sink and across the front for timeless appeal. This rich Murcia Brown Granite vanity top will add the finishing touch to your bathroom. The natural beauty of stone coupled with its durable, lasting appeal will bring luxurious style to any vanity. The durable top has a penetrating sealer that protects against stains by blocking pores and small cracks in the stone. A pre-attached white Vitreous China undermount sink, matching 4 backsplash and sidesplash are included, along with drillings for an 8 center faucet. The top is finished off with a meticulously cut Ogee edge detail around the sink and across the front for timeless appeal. 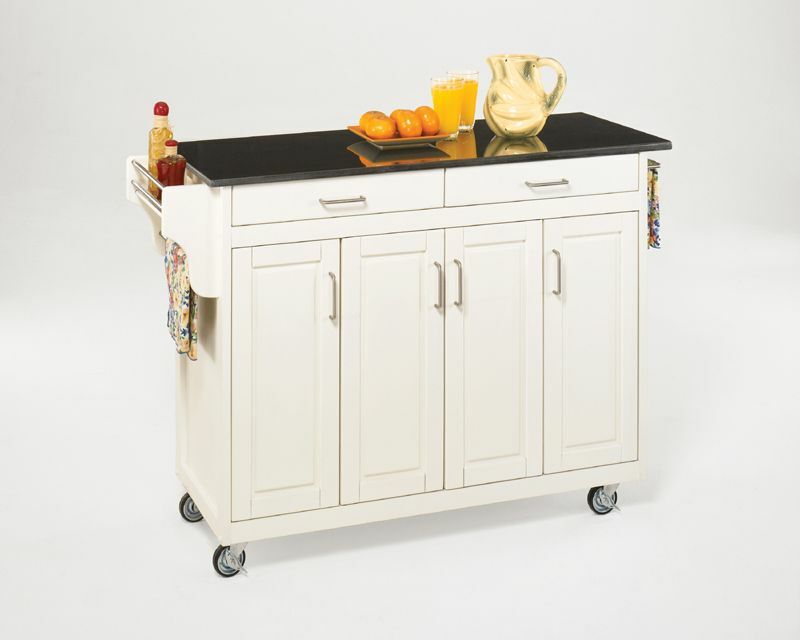 Create-a-Cart White Finish Black Granite Top is rated 3.8 out of 5 by 21. Rated 5 out of 5 by Kathryn from I am so happy with my cart. I am... I am so happy with my cart. I am using it as an island and the size is perfect for the space. It went together easily, looks amazing and serves its purpose for much needed storage. I would totally recommend this item. Rated 1 out of 5 by Donald from Arrived severely damaged.Returned it. ... Arrived severely damaged.Returned it. Rated 2 out of 5 by Cait from The marble top came in broken in half. The marble top came in broken in half. Rated 4 out of 5 by Melissa from Functional, very nice looking piece. Love the extra storage... Functional, very nice looking piece. Love the extra storage and work space it gives me. Rated 4 out of 5 by Anonymous from White kitchen island We like the island! It did come with the top cracked, but Home Depot made it right with no problem. The drawers run a little rough and the end doors are a little narrow, but we just adjusted what we were putting in it. I would recommend it. What style handles does this cart come with? The two images show different styles.